Barbara teaches jewelry-making in the studio a few steps around the corner from the Gift Shop door. 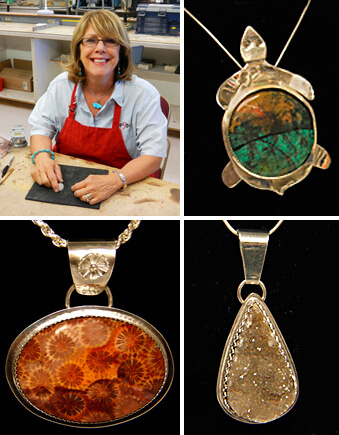 She likes to work with stones and silver, which you can see from the photos of her work—pieces that feature coral, druzy quartz, and a blend of red, green, and black copper gems known as Sonoran Sunset (or Sonoran Sunrise). 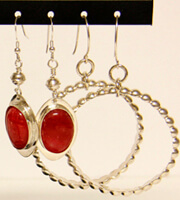 She sets the stones in silver that she fabricates from sheet and wire, or casts in what is called the “lost wax” process.